What dental implant options do you offer? When people ask us about dental implant options, they’re usually talking about one of three different things. The different procedures for dental implants (single tooth, multiple teeth, full-mouth). The different manufacturers or name brands of dental implants. The different methods for inserting dental implants. Below are detailed answers to each of the above implant options. What dental implant procedures does Apple Dental Implant Centre offer? What name brands of dental implants do we use? There are two main manufacturers or name brands of Dental Implants in North America, Hiossen, and Straumann. We have used both and prefer these over other brands. What types or methods of dental implants are there? There are two different types or methods of dental implants, Endosteal, and Subperiosteal. Endosteal is the traditional screw-in-bone, dental implant and is recommended for people with healthy gums and bones. Subperiosteal dental implants are generally reserved for patients where the bone is not healthy enough to support the replacement tooth. Endosteal implants are placed straight into the jawbone. 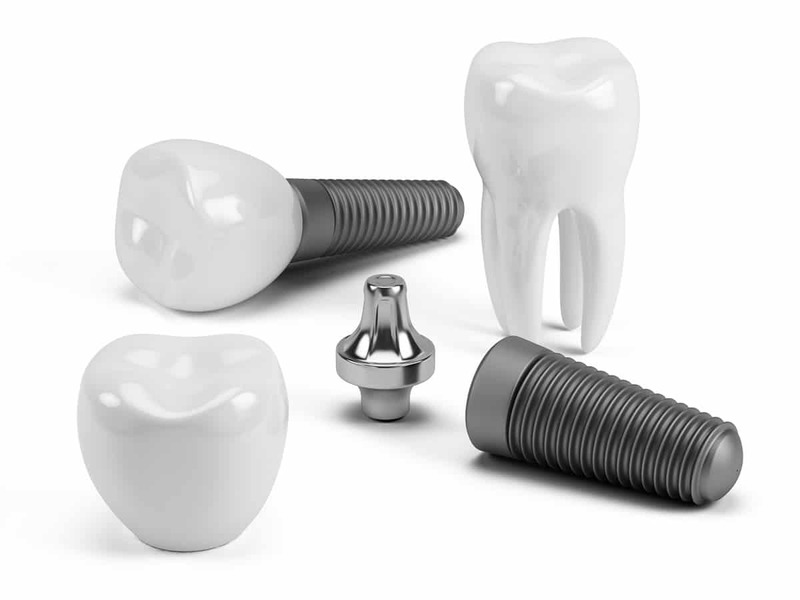 Usually shaped like little screws, cylinders or plates, they are the most commonly used variety of implant. A Custom-made Endosteal Implant is a cast surgical-grade titanium metal frame which is custom-made to fit snugly to your jawbone. When the implant is positioned on the bone, synthetic bone is put over and around the implant then your gums are closed over it. Then, removable dentures or repaired partial bridgework are anchored to the implant posts or a bar above the gums. Lastly, these implants are covered with bonus artificial bone alternative called Hydroxylapatite (HA). Your natural bone turns into the HA covering, forming a biochemical bond which holds the implant firmly in location. The implant: A screw that works as a root for your brand-new teeth. This is what completely and permanently attaches to your jaw. The abutment: A long-term connector, detachable by your physician, that supports and holds an artificial tooth or set of artificial teeth. The crown (artificial or prosthetic tooth): This is the part of the tooth that you can see. It’s generally made of zirconium or porcelain for toughness and natural appearance. Less common than endosteal implants, subperiosteal implants are most typically recommended for patients who have a shallow jawbone and are not qualified for as invasive of a procedure as endosteal implants. Subperiosteal implants are placed under your gums and on top of your jawbone instead of into the jaw bone as with regular endosteal dental implants. They consist of a cage-like metal structure that is positioned over the arch of your jaw bone. In time, your jaw bone anneals to the metal structure, fixing and locking the implant root. Crowns or false teeth are connected to little metal rods that extend through the gums and are connected to this metal structure. If your specialist has actually recommended subperiosteal implants for you, among the reasons is most likely that your individual bone health would likely make recovery from a routine implant treatment excessively challenging. The initial step in producing subperiosteal dental implants is to take an impression of your jawbone. Your Apple dental professional can do this by taking a direct impression of your mouth with dental impression putty. Nevertheless, the impression can likewise be established with CT scan-generated images. Your dental professional will then use this impression to develop the metal structure that will certainly support your implants. When the structure is prepared, it will certainly be surgically embedded below your gums. Posts attached to the structure will remain above your gums. When the tissue around the structure as recovered, your replacement teeth will be connected to the posts, and your procedure will be perfectly completed.